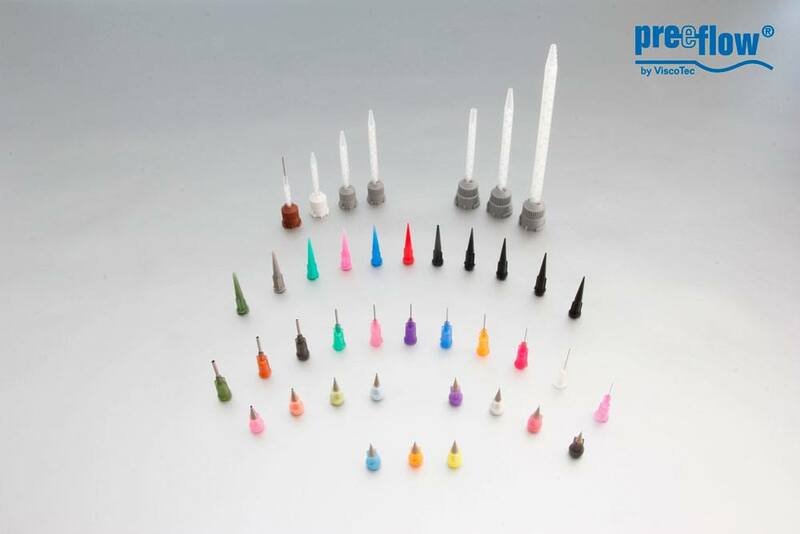 In addition to the existing range of mixers and high-precision needles, preeflow now offers various types of ½” dosing needles. The quality makes the difference: This applies both to the dosing systems and to disposables such as needles and mixers. The years of experience from ViscoTec and from the needle manufacturer led to the use and production of premium dosing needles. The processing and design of the dosing needles and mixers optimizes the application and dosing accuracy of the dispenser. The high-quality needles reduce material loss and improve the production performance by quick and uncomplicated changes, as well as high-precision outputs, far better than comparable, competing models. Therefore, the range of preeflow disposables for mixers for 2-component systems and high-precision needles has been extended to ½” needles with a Luer-Lock connection. These are available in various diameters in standard, conical or black versions for UV applications. The best mixing systems and sizes for the majority of preeflow applications have been combined as a standard mixer, available from a small selection. As a standard mixer for the eco-DUO330 / 450 2-component dispenser, four different 1:1 / 2:1 K- System mixers can be ordered in packs of 50 from preeflow, including a mixer with integrated needle. For the eco-DUO600, three different 1:1 / 2:1 B-System mixers are available from stock in packs of 50. To be able to apply absolute minimum quantities with absolute precision and repeatability, it is also possible to order individual, extremely high-quality, high-precision needles. With the exception of the high-precision needles, which are available separately, all other order-ready items contain 50 parts of the corresponding type of needle / mixer and, on request, other quantities can also be ordered. All consumables mentioned can be shipped and delivered within a very short time.